This morning I received a text from a dear young pal who seems to prefer to communicate ONLY via texting. Thankfully, she’s not yet old enough to drive. She and I WILL cover that whole NO- texting-while- driving issue soon though. Back to today’s text from her – she closed her message to me with the initials CUATU. Rather than texting her back to ask, I looked it up. It means “See you around the universe.” Who knew? I knew BFF, LOL, BRB, GR8T and a few others. Some of this new texting lingo is leaving me in the dust though. So much shorthand to learn – so little cell airtime. How about you? 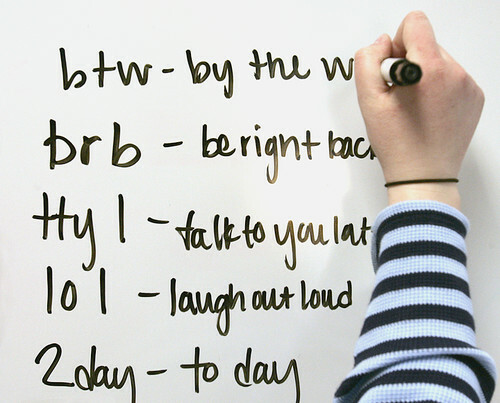 What new texting shorthand has left you amazed, delighted or befuddled ? “meh” is the weirdest one I’ve learned recently. I do text–a lot, however, thanks the keyboard on my phone (just like this one on my computer) I seldom use this new shorthand (nearly failed the original kind in high school). The one that threw me early on was from 2 of my “Grands” and is 143 which is I love you, think this is just between us, but not sure. You did stump me though Lisa, what is GRBT? Thanks, as always, for the help with my “stagnation” any thinking helps! Phyllis, BRB = be right back. meh? i DID look it up and found that it suggests ‘whatever’. can you tell me more? hmmmmmm Becky… SO HOPING you’ll tell us more about 143. 🙂 and GR8T= great. who knew? thanks to you both for commenting! My favorite is ROTFL= rolling on the floor laughing. Then there is LOL which I always say is Lots of Laugh and my daughter keeps correcting me; she says it means Laugh Out Loud! Oh, don’t get me started! As a teacher, this whole thing drives me crazy! These kids are so used to writing like this, many seem unable to remember how to really spell and write! They’ll use “4” instead of “for”, “u” instead of “you”, etc. for their written schoolwork, and I think they think it’s just fine. AUGHH! (That’s an old-fashioned spelling for a scream of frustration—I think I learned it from “Peanuts” or some other comic strip.) Anyway, my attitude makes me feel very, very “old school”, and not at all hip! My daughter laughs at me for texting with words completely spelled out, with proper punctuation and capitalizations. It may take me five minutes to punch out one sentence, but I am insistent on maintaining my literary dignity!